Pour over coffee makers are great. They are very convenient, look very simple and aesthetically pleasing… But, are they all equally great? We will break down two significant brands Osaka and Chemex for you today. There are two top-rated models that are buyer’s favorites so we decided to show them to you. 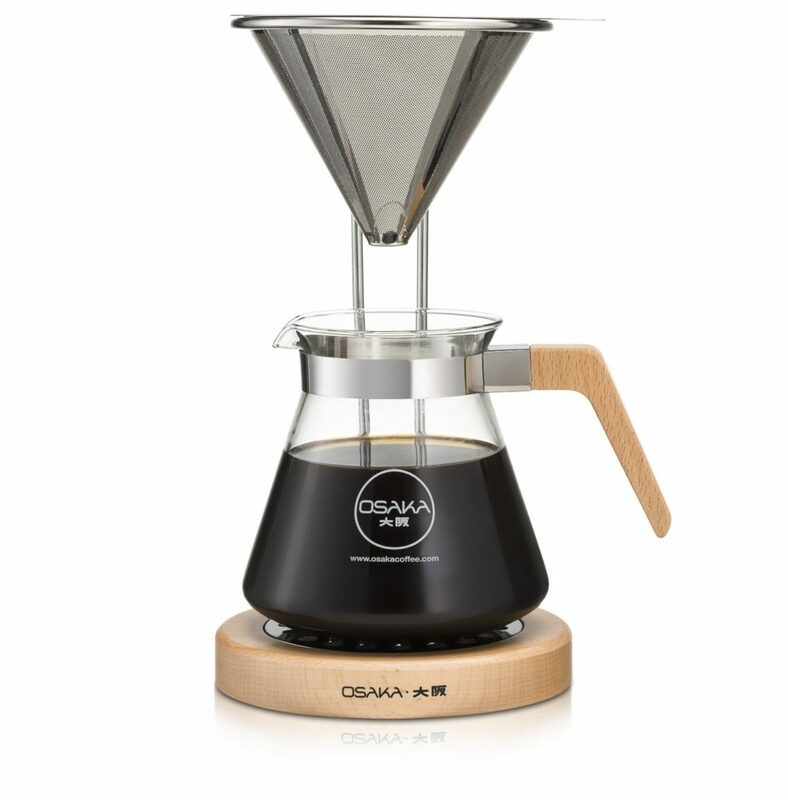 Starting off, we have the Osaka Pour Over Coffee Maker with Reusable Stainless Steel Drip Filter, 37 oz (7-Cup) Glass Carafe and Lid ‘Senso-JI’. This model has a stainless steel cone filter, which means that the double filter has additional mesh inside and it is laser-cut. Paper filters are very money-consuming and this method will help you get a creamy tasting coffee. The borosilicate glass carafe is made with extra care for it is resistant to any thermal changes. It doesn’t absorb odor or chemicals so it will not affect your coffee in any way. The glass lid closes up the mouth of the carafe completely and acts as a thermal isolator to keep your coffee hot. It is also made from borosilicate glass. The heat-resistant collar is not only cute and colorful, but it also isolates so you won’t get burned when pouring the coffee. How to use Osaka pour over? It’s very easy to use. You just place the filter on the top of the carafe and fill it with coffee grounds. Then you fill the kettle with hot water, pour it in slowly and wait a minute and a half for the dripping to stop. That’s it! Isn’t it fast and practical? Well, what about the Osaka Pour-Over Coffee Dripper with a Wood Stand? This pour over coffee dripper is not all similar to the first model. It has the capacity of 20 oz (the first one has 37oz). 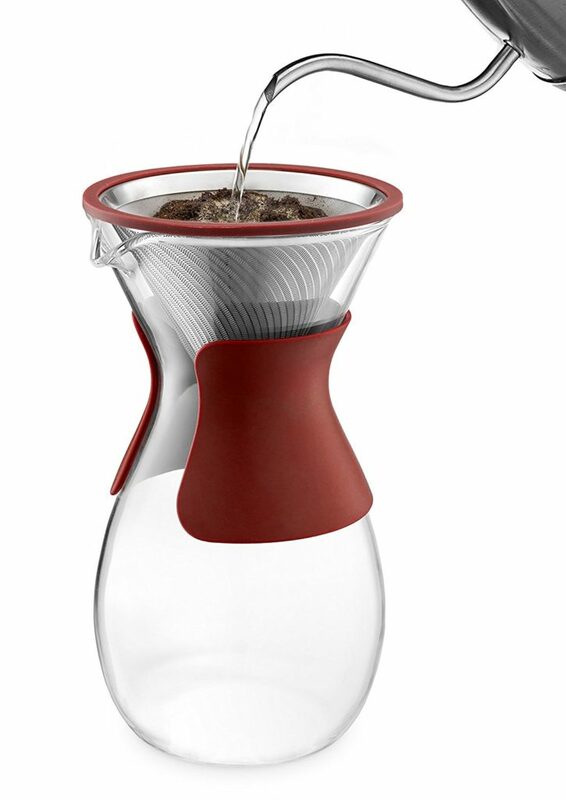 It has the steel cone filter, just like the first one, but with this one you’ll get a full brewing set: waterproofed wood, a metal stand, the glass carafe with the led and the filter itself. Once again we meet with the borosilicate glass, best of its kinds for these types of brewers. The glass server has wood trimming and the wire stand also. The system used to make coffee is the same. The Chemex Pour over Glass Coffeemaker from the Classic Series is similar to Osaka’s models, but is it better? It has two styles: the classic one and the one with the handle. We’ll start with the classic one which is a 3-cup coffeemaker. Actually, you can buy a 3-Cup, a 6-Cup, an 8-Cup and a 10-Cup one too. It is made out od borosilicate glass which lives up to Osaka standards. You can refrigerate and reheat the coffeemaker and the coffee won’t lose the taste. It’s simple and easy to use for the design is much more simple than Osaka’s. The process of coffee-making is very similar; the only difference is the filter. This coffeemaker uses discardable filters and you’ll have to get a new one each time or you can buy reusable stainless steel coffee filter cone for Chemex. The design of this product is very popular for it has been chosen as one of the Top 100 best-designed products of modern times. The „with handle“ style is from The Glass Handle Series and it also comes in same sizes as the previously mentioned one. It is just a variation of it. 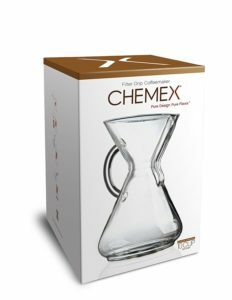 Chemex claims that you’ll have a long relationship with this product if you keep it clean. Remove the wooden handle (used so you don’t get burned while pouring) and wash it manually or in a dishwasher. The design is made specifically to make the neck of the coffee maker cold, although the bottom where the coffee is can even hold steam. This ensures safe handling. It weighs is a little lighter than Osaka. How to use the Chemex brewer? Chemex is the most popular and best-selling pour-over coffee maker on the market, but in our opinion difference between Osaka and Chemex are not to big. So the major difference between them is price. If you’re money-wise go for Osaka.